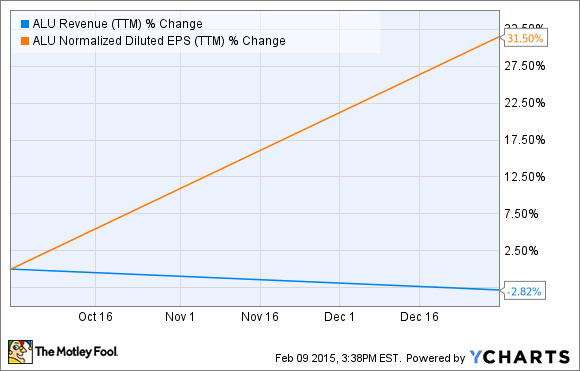 Alcatel-Lucent SA (ADR) Earnings: Is This Turnaround for Real? The French telecom equipment giant seems well on its way to a big bounce. So, why isn't the stock soaring? Hint: Investors hate execution risks. Alcatel-Lucent CEO Michel Combes. Source: Alcatel-Lucent. When Alcatel-Lucent (UNKNOWN:ALU.DL) reported fourth-quarter earnings last week, CEO Michel Combes underscored "the success of our turnaround." Combes talks a big game, but do the numbers back him up? Comparing Alcatel-Lucent's fourth-quarter results to Wall Street's expectations, the company is certainly doing all right. Analysts were looking for adjusted earnings of $0.04 per American depositary share on $4.56 billion in total sales. The company delivered a slight revenue surprise at $4.60 billion, but also a solid earnings beat at $0.10 per ADS. ALU Revenue (TTM) data by YCharts. Throwing one more crucial metric into the mix, the company also reported positive free cash flows in 2014, for the first time since 2007. That's a very welcome change of pace. So, the company is trading in some easy sales in exchange for stronger profit margins. Alcatel-Lucent has refocused on a smaller product portfolio in high-margin markets, such as high-volume IP routing and long-distance data transport. The barriers to entry in these sectors are high, reducing the list of serious competitors to a mere handful. In most cases, the new Alcatel-Lucent really only worries about pushback from Cisco Systems (NASDAQ:CSCO) and Juniper Networks (NYSE:JNPR), leaving the highly fragmented mosaic of commodity networking behind. Mind you, Juniper and Cisco are formidable competitors. Still, this newfound focus under the Shift Plan banner allows Alcatel-Lucent to spend its research euros where they matter most. Shift Plan cost savings are running ahead of schedule, and the bottom line has responded in a big way. So, is Michel Combes on the right track with his turnaround efforts? The proof is in the pudding, and I think he's got a good recipe on the stove. If Alcatel-Lucent can continue to deliver positive cash flows and strong earnings, investors should forget about the dipping revenues soon enough. It's the bottom line that matters most, after all, and Combes is laser-focused on exactly that. The Alcatel-Lucent 1830 Photonic Service Switch is a cornerstone of the company's optical portfolio today. Source: Alcatel-Lucent. The financial engineering bit of this turnaround appears to be on target. From here on out, I'll keep a close eye on how Alcatel-Lucent's big-iron routers and switches stack up to the best products from Cisco and Juniper. This is where the rubber meets the road -- or not, depending on how the French veteran's R&D efforts pan out. Meanwhile, investors are looking at a stalled-out stock. Alcatel-Lucent shares have more than tripled since the summer of 2012, when the Shift Plan was in its infancy, but also traded largely sideways since the end of 2013. One good quarter is not the same thing as a successful turnaround, and Combes must prove that his company has staying power. Until then, Alcatel-Lucent's stock continues to look cheap, with a price-to-sales ratio of less than 0.7. By contrast, both Juniper and Cisco trade for more than 2 times trailing sales. If Alcatel-Lucent can follow through on this quarter's implied promises, shareholders should be richly rewarded aver the years. But the ditches of Wall Street are littered with the carcasses of failed turnarounds, which is why you'll get a big risk-based discount even now.